I love a good Asian broth. I think I could eat Asian food all the time and I honestly wouldn’t get sick of it. The good thing about it is it’s generally gluten free which works well for me and I love the light and refreshing flavours you get particularly with Vietnamese food. Another bonus is how quick and easy the food is to make! Vietnamese people don’t spend hours slaving away in the kitchen as it’s so hot (aside from making pho broth but that’s left on it’s own to simmer) so a lot of the food is prepared in less than 10 mins. I made this dish for my sister who had a just come back after a couple of weeks travelling around Europe and was feeling rather sniffly! 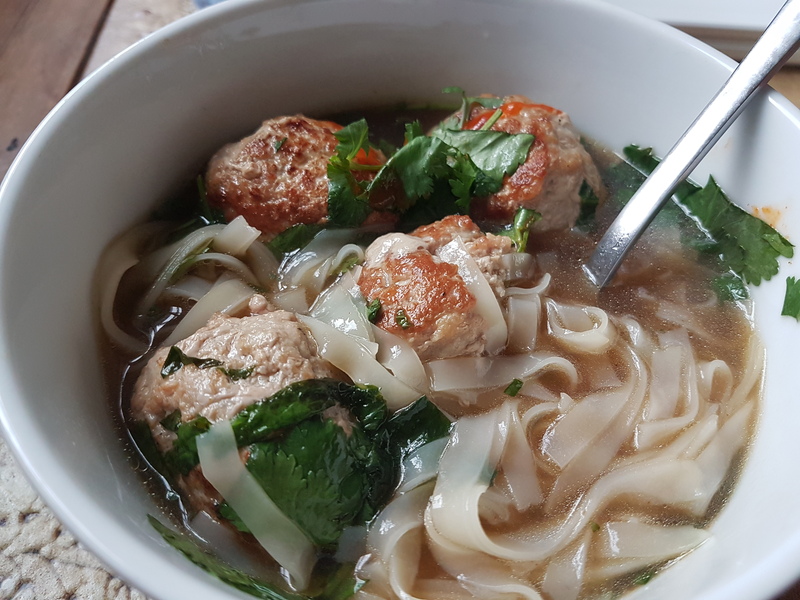 I had some pork mince in the freezer as well as a couple of tubs of homemade chicken stock which I would highly recommend using over chicken stock cubes for the cleanest flavour. If you don’t have homemade chicken stock to hand, don’t worry. A liquid stock from the supermarket is fine too. 1. Put your chicken stock on the high heat and add the star anise, coriander seeds, cinnamon, lemongrass and salt. Bring to boil and then have it at a nice rolling simmer, you want to reduce by around a 3rd and to extract the flavours of the aromatics. I had mine cooking while I prepared everything else below. 2. Heat your oven to gas mark 8, (450 fahrenheit, 230 celsius) In a large bowl add all the ingredients for the meatballs and mix with your hands until thoroughly combined. 3. In a large skillet or frying pan that is oven friendly (I had to use two to fit all the meatballs) heat a decent glug of olive oil or oil of your choice on a medium heat. Once hot, place the meatballs in to brown on each side, it’s good to have a nice bit of colour for maximum flavour. No one likes an anaemic meatball. 4. Place the pans in the oven for around 10 mins until the meatballs are cooked through. 5. While these are in the oven, boil the kettle to prepare your noodles. I poured the boiling water in the bowls I was serving them in and then strained the noodles after cooked. The instant noodles take around 3 mins but your bowls will be nice and hot! 6. Chop up your herbs to prepare and then taste your stock. It should be quite acidic from the lemongrass but you’ll find it will need some depth. This is when the soy and fish sauce come in! Add a good couple of glugs of each and taste. If you get the umami flavour then strain into another pot and keep on a gentle simmer until the meatballs are done. If still a bit too acidic then add a bit more fish sauce. Don’t go too crazy on the soy as it would just make it salty. 7. Take the meatballs out of the oven and place 4 in each bowl on top of the cooked noodles. Pour in the broth and top with the herbs and chilli oil or Sriracha if you like heat! Enjoy. Would love to hear how you get on with my recipe!